Climbing the highly polished marble stairs, Nikki and I could hear them before we saw them: “Ni hao!” (Hello! Welcome! ), and as we rounded a corner for the second set of stairs—three ladies in white uniforms looking like nurses or people who practice the healing arts, greeted us, big smiles across their lipsticked faces, and my first thought was… in this heat with the makeup? How do they keep it from sliding off their faces? Welcome to Changsha, Hunan, China, where it was now dark and still 90ish degrees with 80ish percent humidity. The outdoor temperature and wetness here do not change, though the degree of indoor air conditioning varies, depending on where you are. But there was no time to mull that further because the trio of Chinese women was approaching the two tall (to them) foreigners getting taller with each rising step. 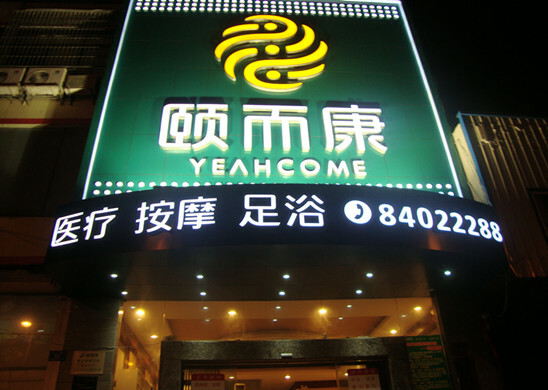 And after more rounds of greetings, Nikki said, “Yep, this is the place,” and I was amused that its English name translated to the Yeah Come massage center. It was going on 9 p.m. on a Sunday, and if I didn’t know better, I’d think we were either about to ask for something that in our country is highly illegal or maybe showing up for Botox injections. 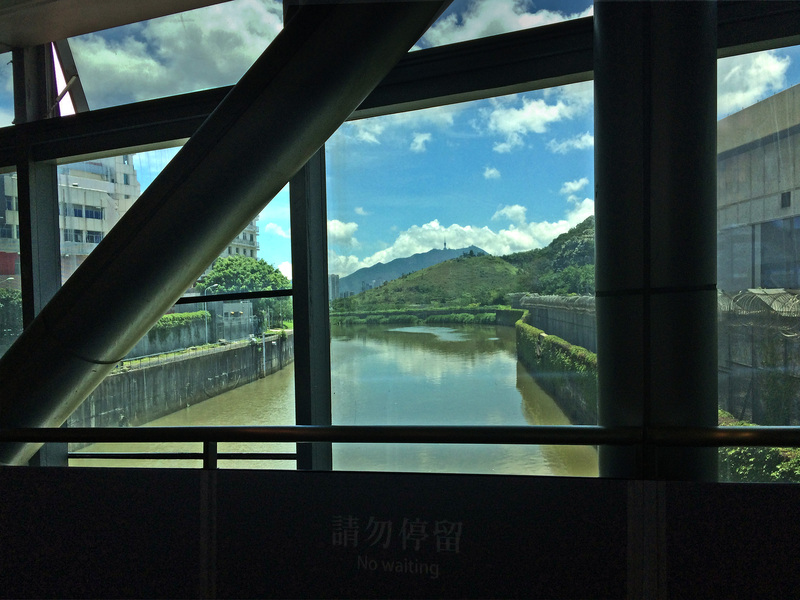 The Shenzhen River separates Hong Kong from China—you walk across it. 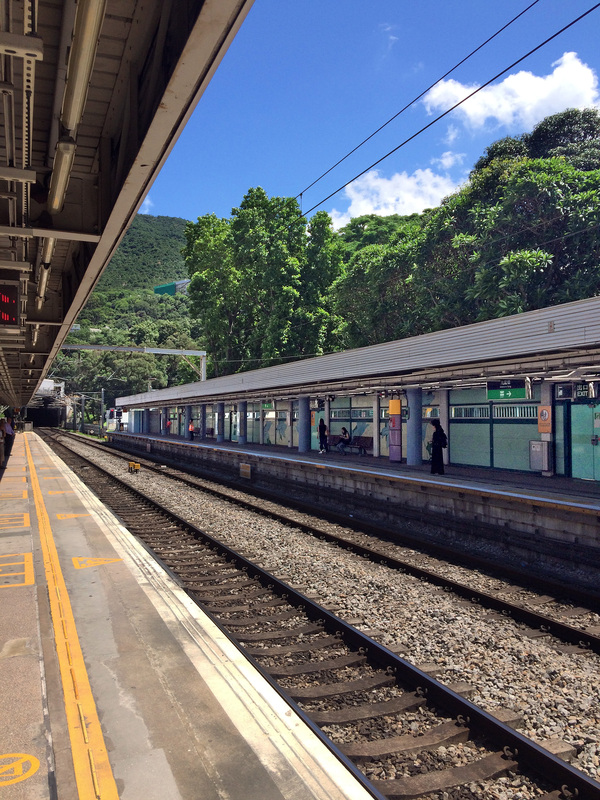 This was where we were to board another series of subway and light rail (sometimes above ground, sometimes below) trains, changing lines a couple of times, and these were clearly not as well cared for as the Hong Kong subway cars. This is where I began to learn that Hong Kong and China really are, always will be, two different countries. I hadn’t understood that. Nikki had said that she could tell the difference between Hong Kong Chinese and mainland Chinese people, and I was beginning to, too. It seemed that there were more mainland Chinese, for one thing, and the men looked either very young or prematurely old with bad teeth, and there was something about them I couldn’t quite identify, and it wasn’t their luggage or what they carried, but there was the feeling of—and I don’t know the Chinese word for this—conformity, of being herded into these massive clots of humanity moving toward a single target—the opening doors of the train. We saw knots of people in Hong Kong, too, but those people, often young couples with small children or teens with their friends, every one of them carrying the iPhones that are made in factories in their country, seemed… I don’t know… more prosperous, more hopeful, more free somehow. And I figured that was my imagination going 300 miles an hour, as fast as the bullet train, as I took my first walk-through in a Communist society, in the most populous country in the world, and I had to allow for my own biases and western misperceptions as much as anticipate theirs about me. Leaving Hong Kong for China via train. It was on one of the subway cars, after Nikki and I rolled on with my rolling backpack and her wearing her huge orange packer’s pack, that a young man got up from his seat and offered it to me. Nikki had told me this might happen, which was why I shouldn’t get my hair colored before we left, that some kind Chinese person would see me as an elder and give me his seat. And there it was, on the second full day in China, which was really the third since we’d lost one night on the plane winging its way west over the international dateline. He smiled at me as he stood, and Nikki said, “Take it,” so I did, sliding into a smooth seat next to a young couple with two children on their laps, the mom holding tight to a little boy with an iPhone in his hands, his eyes glued to the screen where a cartoon airplane zoomed around a pastel sky. I smiled at him and his mom, and she smiled shyly at me and said something in Chinese to her son, and I wondered if it was something about the old while lady parked next to them. He looked up at me and showed me his screen. I smiled, nodded and said, “Xiexie,” which is pronounced “shay-shay,” and means “thank you” because that’s one of my Chinese words I was practicing this day, as we moved deeper into mainland China, we moved closer to Changsha, where Annie lives, and the place we will be taking her away from forever. And when we exited the train in Shenzhen, we walked into that wall of heat, the kind Nikki had tried to describe to me at home in what we Sacramentans think of as summer—“Think Mississippi in summer,” she said—and I tried, but I’ve never been near Mississippi in any season. Still, I imagined bodies with permanent trickles of sweat running down their backs and glistening, red faces. And that’s what we became in an instant, thrust by the power of a hundred, then two hundred, then who knows how many hundred Chinese, a river of humanity flowing their way into air so thick you could drink it, but you didn’t want to because the first breaths tasted foul, left a sourness unlike any I’d known on the tongue. I began putting together similes in my head (damn writers). It felt as if I were breathing underwater, oven-like, humid subtropical, so much water vapor in the air you can taste it. I could feel my already curly hair curling more, my skin shedding the water from my very cells, my personal humidity rising from feet to forehead. The moist air felt heavier, but, according to meteorologists, it’s not—it’s actually lighter than dry air. I looked at Nikki and said, “Whoa,” and she nodded. “Right?” she said because it felt stuffier and hotter than Hong Kong. I knew that Nikki hadn’t felt humidity like this for four years, since she left China for the final time, after what became a decade as a volunteer with a couple of different Christian organizations, including one that operates orphanages where Nikki was in charge of short-term volunteers, ferrying them from place to place on trains like this one and bigger, faster trains like the one we were to board for a 3 p.m. departure. Coming down the escalator (lots of escalators in Chinese rail stations, I’m learning), mashed in between people who in no way looked alike but who resembled each other ethnically, more hundreds of sweating, luggage-toting people, we could see the huge train station unfolding before us, half open to the sky under a many-stories tall curved overhang and a vast, open area uncovered and more glass and still edifices that looked as if they’d been built for the Olympics or some grand purpose (they weren’t—this is the modern train station in China). And we were delivered to the area where there were ten windows with dozens of people lined up to approach each one, but Nikki, who reads and speaks Chinese, couldn’t tell which one to go to, left me with the luggage and want to another, less populated line to ask where we should be. This was one of the unnerving parts of the day—being left with our luggage as Nikki went off to find out something we needed to know. I am not prone to panic, but I have to say that my stomach jumped around a bit until she returned—I know I will have to do things in this place where I don’t speak the language or know where to go, but she is my lifeline here. In the underground maze of the Hong Kong subway, changing lines and different platforms, even when she wasn’t immediately sure which way to go, Nikki’s level of confidence is what keeps me from freaking out. I am a strange organism in this place where all the other organisms know their places and move in what seems to me well-coordinated patterns to get where they want to go. But on this occasion she returned fairly quickly and said, “We get in this line, and then go through there to line 11.” She shook her curly head. “I had to ask him three times what line we were to stand in once we got through this one. ‘Through there,’ he said” (and Nikki was speaking Chinese to him). “Yes, but what line?” She mimicked herself. “Through there,” she gave his line. “But what LINE?” she insisted. “Oh. Eleven,” he told her. Nikki (orange backpack at left) waits in line to pick up our train tickets. So after showing our passport and travel papers to the 13-year-old girl (she looked that young anyway) in the Plexiglass box (who at least had a small fan pointed at her spotless blue uniform, offering small comfort, I imagined), we went into that area and found Window 11. We stood behind only two other people—an older woman with hair dyed a color I’ve seen on Madonna—roughly the color of a bruised plum, sort of purple-y Crimson—and that woman was at that counter for (I timed it—26 minutes) haranguing a beleaguered looking man who, translating Nikki explained, wanted to go to a station in Guangzhou this train didn’t go, but she couldn’t understand the man who was speaking Mandarin to her Cantonese. He turned the screen around so the woman could read what he was trying to tell her, and she stood there and argued and waved bills at him as if that could change the route of the trains in this station. Another man, clearly agitated behind Nikki, shouted, “Hurry up!’ This made Nikki smile because we were thinking it, too, and it was sososo hot in that pocket of the station, not a breath of air, and I finally had to excuse myself and take my little rolling backpack for a walk, hoping that a slight breeze might waft my way, which it didn’t, but I felt better for the walking and bad for Nikki stuck at the front of that hot line. I circled back a number of times and the woman was still there, yelling, gesturing, and Nikki stood behind her with her tall rusty orange backpack rising behind her head, the very picture of patience, though I knew she wanted to use that big orange backpack to body check the woman, get her out of the way so Nikki could complete our simple transaction that would put us on the train to Changsha where, I hoped, Annie knew that her new mama was coming for her tomorrow. The woman finnnnnallllllly got done, and Nikki was at that window in a single step, glowering at a young man who looked as if he was ready to cut in front of her. The young man stepped aside and Nikki stepped up, and she was done with her transaction as it should have been, in less than three minutes. And even at a distance I could see her backpack moving toward me, forward motion now, after being stationary far longer than was comfortable, and she had two small train tickets in her hand. 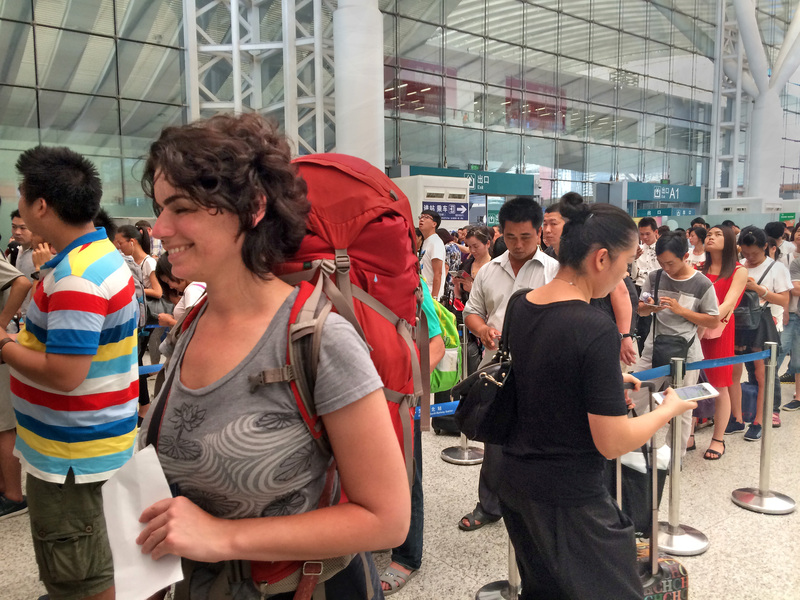 “Now to go through security again,” she said, so we made our way to THAT line. We had been through three scanners where we had to put all our bags on conveyor belts for officials to allegedly look at. And there they were, the people of the People’s Republic of China, thousands of them—and us, too—in yet another line making its way slowly someplace that would lead to the next line and the next. And I thought then that Communist China was fast losing its charm, despite the impossibly young “guards” wearing their official uniforms. But we got through that scanning business again and we were finally in the vast waiting area of the train station. We stood there for a bit, looking around, and Nikki pointed to a sign in Chinese on the second level. I didn’t recognize the characters, of course, but I did recognize the red and white sign with an old white guy’s face on it. 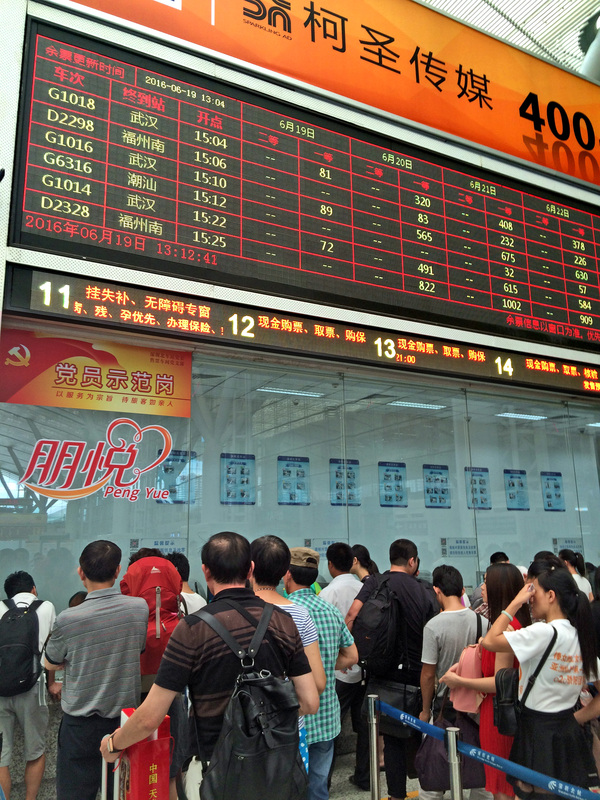 KFC’ll do in a pinch—the Shenzhen train station. 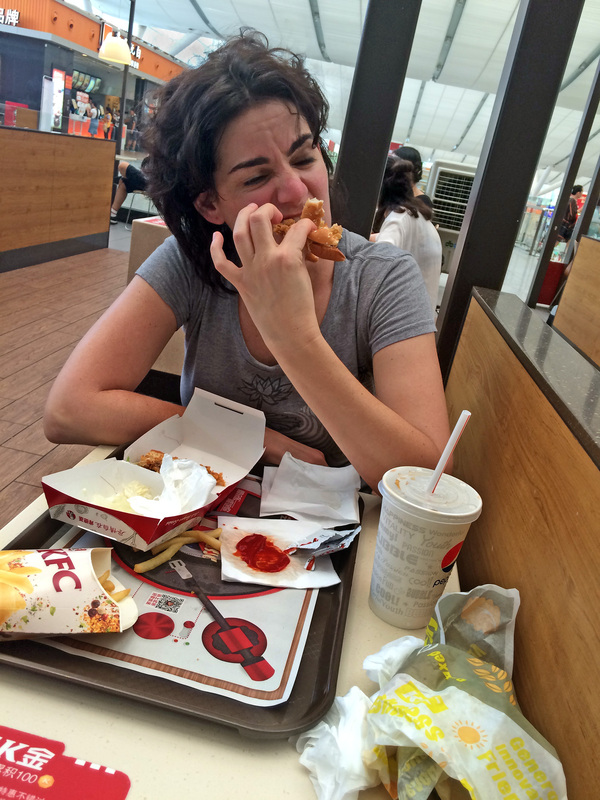 “KFC,” she said, and though I really don’t care for KFC, it was lunch time, and in this place because I only eat and drink what Nikki says I can, Nikki knew that this was reasonably dependable food, so we rode the escalator, ascending into an even stuffier place because heat rises, after all. But we made our way to the KFC seating area and easily found seats for us and our luggage near a big, slowly turning fan. It was not cool, but at least it provided an occasional swish of breeze before returning us to China’s regularly scheduled program of moistness. And Nikki went off to buy chicken sandwiches and fries and a Sprite with rare crushed ice made with boiled water for us, and I once again was fussing with my money belt inside my pants, trying to discreetly put away the Chinese hundreds we’d gotten at the moneychangers just over the border, which seemed like a week ago, though it had been about an hour. And she returned with lunch, and we sat there, trying to catch our breaths, each of us reaching for some kind of medication (Excedrin for me) to stave off symptoms associated with the condition of too-freeping-hot that were already hitting us. We ate and rested until Nikki realized it was almost 2:30, and our train was leaving at 3, so we leapt up, quickly gathered our belongings, and I followed a hustling Nikki back down the escalator, the air temp decreasing a few degrees with every foot, which did not make the air any less oppressive but at least felt different. Then the challenge was where to go, which platform, and I followed Nikki, walking fast now, looking for someone to ask, and she found him, at a counter under a sign marked “Enquiry” and he told her A5, which it turned out was printed on our tickets, but we hadn’t recognized that as our gate number, jammed, as it was, between other symbols in Chinese. 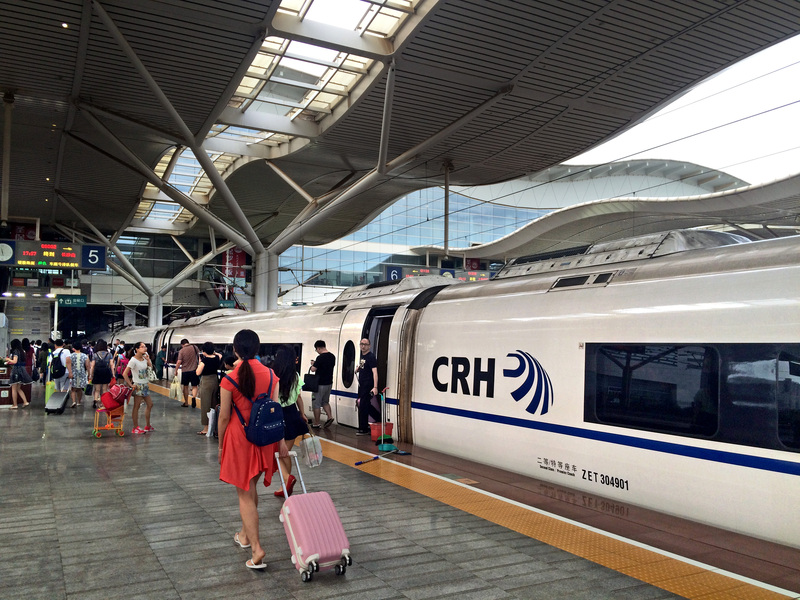 Boarding the fast train to Changsha. where we had to find Car 1 and our two seats, 6D and 6F, where we would sit and watch a big swath of city give way to countryside, then city again, the back to curving rice fields and foothills and tall mountains that got taller and more interestingly shaped as we went, as the bullet train took us to Changsha and Annie. 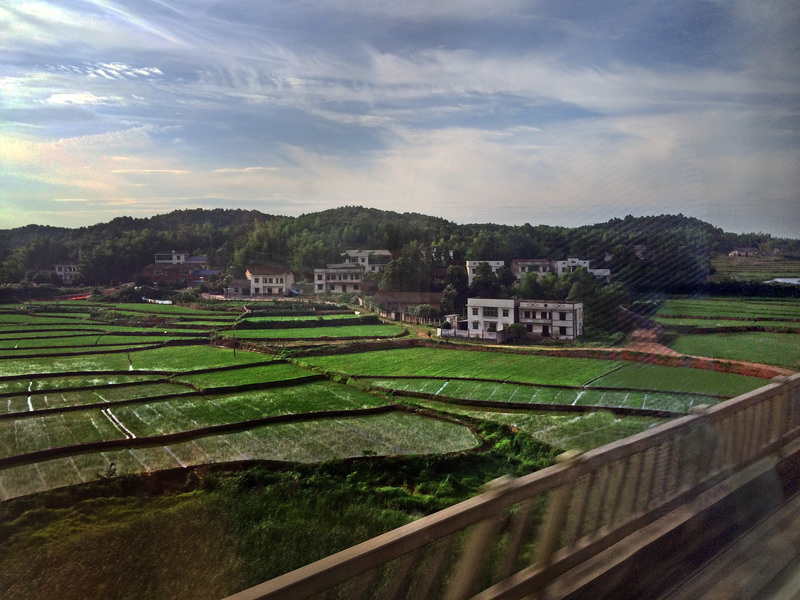 Rice fields and foothills give way to mountains on the way to Changsha on the fast train. 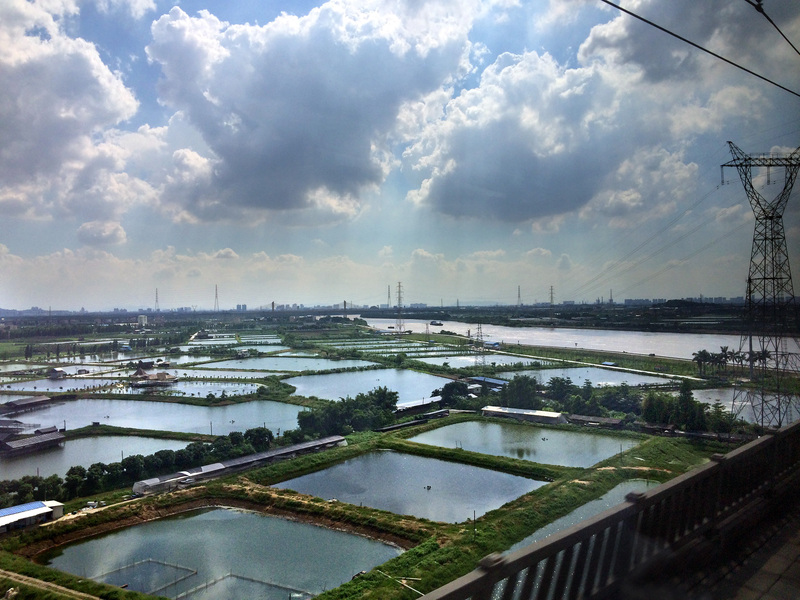 Fish ponds and a great rivers from the fast train to Changsha. After we arrived in Changsha, took our first holy-god-hope-we-survive-this taxi ride to our hotel and had dinner at Quan Deli, a restaurant that Nikki loves (and has already redefined good Chinese food for me) at the base of the hotel, Nikki said it was time for massages. That’s why we were climbing the stairs to the Yeah Come massage place where two ladies with kind smiles and dressed in white like angels led us to a room that had three massage chairs in it with large ottomans for feet and legs. This, apparently, is the Yeah Come way—they put you in a room with a closed door, offer you hot tea with ginger and a piece of dried fruit, kindly request that you take off your shoes and sit back. 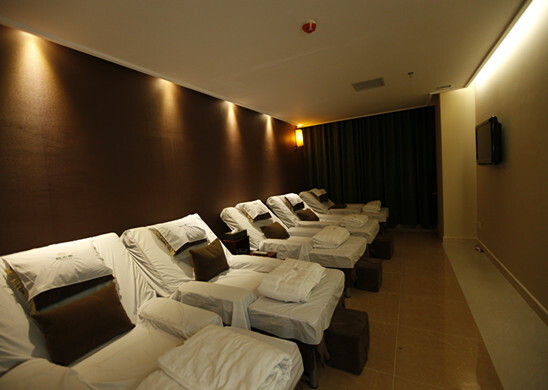 Clothes stay on, but you will have face and head massage, then neck and upper back, then your feet will get the most pampered they’ve ever been with a combination of acupressure (what pressure!) and thumb digs and long strokes down the bottoms of your feet, and you can feel the tension of traveling 7,000 miles to get here, to this city, to take on a new person and bring her 7,000 miles in reverse to a new life none of you can quite imagine, except that by this time tomorrow Nikki will be two, will always be thinking of Annie first, and yes, dammit, we deserve these massages. So, eyes closed, you drift into second person, no longer thinking as “I,” but as some amorphous “you” and listen to Nikki talk to the two massage therapists softly in Mandarin as one of them kneads that place in your left foot exactly where it broke a few years ago and it’s still tender, but you breathe through it and feel something almost liquid draining out of your sole, and you smile at that thought, the double-entendre of spirit and what has carried your for almost 58 yeas now, your good feet, and oh, after a while you can’t even feel that foot—it has floated off into the netherlands, but you don’t care how you’ll walk back to the hotel. The tastes of the good dinner at the restaurant Nikki loves—the wide rice noodles with cucumber and peanut sauce, the exquisite dumplings that are precisely what dumplings should taste like, the smokey puer-eh tea that not only tastes yummy but is reputed to be so good for you, the flaky, pita-like bread rounds on which you placed thin strips of cooked beef dragged through hoisin sauce… all that marinating happily in your belly, moving through your digestive tract as it should. You are well fed and pampered now, you comparatively rich American women, and you are so grateful after the day you’ve had, after arriving in Changsha in the late afternoon to again, more humidity and the long snakes of lines winding around as if people were waiting for a ride at Disneyland. And it turned out that you did indeed climb into Mr. Toad’s Wild Ride in a not-exactly-clean taxi through the streets of Changsha, dodging and weaving other vehicles like a sinuous, slithering thing, Nikki in the front seat talking to the man in Chinese, who didn’t want to take foreigners in his cab because they’re too much trouble and who, Nikki thought, was pretending not to know where the hotel was, even though she showed him the business card with the address and a little map on it. After one near-miss with a large white van in the “lane” next to us, Nikki said, “You might want to close your eyes,” and you did, because to look ahead or to either side out the windows triggered every panic nerve in your body. 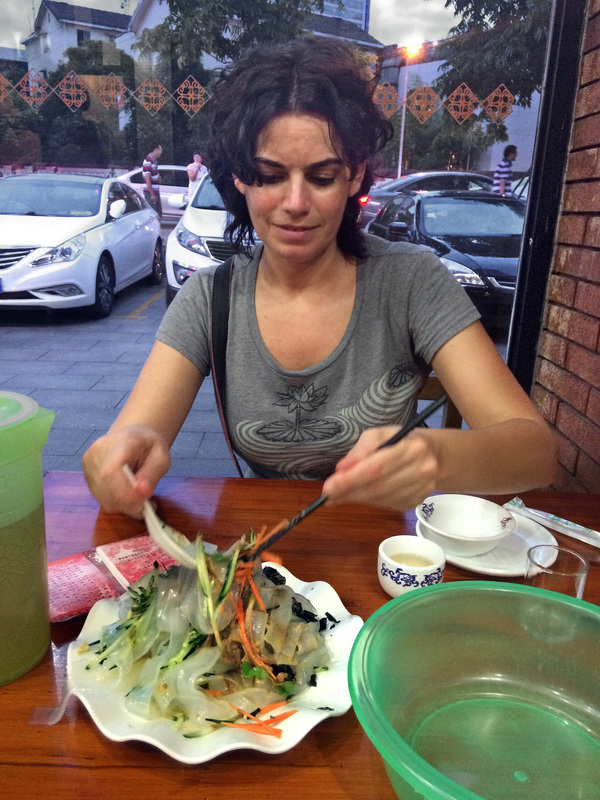 Nikki serves us dinner at the Quan Deli in Changsha. where Nikki carefully studied the menu as though she was memorizing it (she was really trying to remember what she liked and what the symbols meant—her Chinese, after all, is four years rusty), after ordering and inhaling such good food, now you have literally given yourselves over to these women who held your foreign feet in their hands, who are massaging away the dreck of travel, the blanket of tension and anticipation that has been hanging over you for months, over Nikki for years. After working on your heads and feet, the women with their powerful hands have you turn over and take off your sweaty T-shirts, put your arms into backless, long-sleeved tops, put your faces in holes on the now-reclined tables, and, gently unhooking your bras and tucking the straps under your armpits, they lotion up their hands and begin, with long, sure strokes, surfing your backs, sending every worry, every doubt, every bit of stress and strain it had taken to get here, to this city, this very room, down your backs, where it drips down your legs and off your feet like blessed, healing water. When you finally sit up after 90 minutes, you feel woozy with relaxation, still not entirely in your bodies, coming halfway back from a meditation so deep you’ve drifted into a place that is hard for you to reach on your own, that place of peace where everything is OK, better than OK, that floating, glorious place of no place exactly, where the body has gotten out of the way and the spirit rocks on the surface of whatever you think of as you, mindbodyspirit all aligned for once, pure bliss. You wonder, is this enlightenment? If not, it feels darn close. You got yourselves returned to you today, put back in your bodies again by two Chinese women with some of the best professional hands that have ever touched you. You have been restored, and after a good night’s sleep, even more renewed, you will go out into Changsha tomorrow and meet Annie. Nikki will become a mom, and you will get to witness the moment after which nothing will ever again be the same for these two. A thousand blessings bestowed after a thousand tears, two lives forever changed, for better or for worse. You have great faith that it will be far better than worse. Thank you for going on it with me… you were there, you know, for all of it! Thank you, dear Kathryn! I’m so glad you’re along for the journey. I carried your love with me the whole way… I truly did! Oh! I love this: Nikki’s irrepressible wit, your determination to stay positive even when it’s extremely challenging, the Mr. Toad’s Wild Ride reference (my mom said that often), slipping into 2nd person POV while getting a massage. Looking forward to more segments! Thanks, Corinne! Love the specifics of what you love… so very AWA and just what I needed to hear… what’s working, what’s strong!